A lot of random stuff has caught my attention this week. Hope there's something here to pique your interest as well. 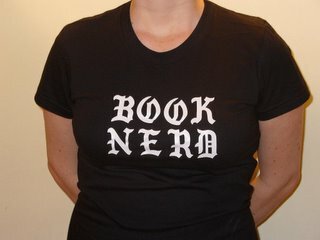 - Publishers Weekly has this article about a brilliant idea: t-shirts as literary inside jokes (and a great fundraiser). Lou Bank, described as a "book marketing professional", has come up the Novel-Tees, project, a line of t-shirts advertising fictional businesses like Championship Vinyl, the record store from Nick Hornby's HIGH FIDELITY, and Mama's Restaurant from Andrew Vachss' series of Burke mysteries. The proceeds go to Protect.org, a political lobby dedicated to fighting child abuse (a subject I know is dear to lawyer Vachss' heart). They're being sold in bookstores as well as from the Protect.org website. What fictional business or institution would you buy a t-shirt for, especially if it was for a good cause? - Britain's influential paper The Guardian has devoted a lot of space to the subject of independent bookstores in Britain lately. January saw a fairly snarky article about how many small bookstores just weren't that great compared to the Shangri La of the chains and the online stores, though it did make the valid point that those stores will have to evolve or go under. (The largest chain in Britain, Waterstone, just bought the second-largest, Ottakar -- it's like Barnes & Noble swallowing Borders to create a super-mega-chain.) Then there was a great response to that article in a special report with a visit to some small bookstores that are actually beloved and prospering, and an analysis of what it takes to make it as an indie bookstore in Britain. Last Saturday saw this article about the Independent Alliance, a group of small publishers working together and with small bookstores, and modeled in part on the success of Booksense in the U.S. The landscape for independent bookstores in Britain may be in some ways even tougher than that in the United States: the chains and supermarkets selling books are all crammed into a smaller space, and there's no strong organization like the ABA to give indies a kind of collective power. Still, the small bookshop remains an important cultural icon in that country, and we can learn a lot about how indies succeed and fail from their example. Fascinating stuff. - Lastly and most thought-provoking, Rachel Donadio wrote this article for the Sunday Times Book Review about the potential for environmental responsibility in book publishing. Her take: "But how green can an industry ever be whose product depends on felled trees and toxic ink?" My take: at least publishers are starting to try. As an industry that thinks of itself as (at least potentially) a noble one, purveyors of ideas, emotions, culture, and dialogue, it's about time we started thinking about how all that "virgin" paper, all those pulped returns, all those unused galleys and stripped mass market paperbacks, not to mention the beautiful and cherished hardcovers that build our libraries, are affecting the world we live in. It's certainly time for the book industry to rethink some things in order to live up to its implied ideals, and I'm proud of the Green Press Initiative, NativeEnergy, Random house and others for starting the process. Hope these get you thinking. See you on Wednesday!